Using plaster press molds is a great way to make consistently sized pottery without slip casting or throwing on the wheel. If you’re not proficient in slipcasting or don’t like to throw on the wheel, but want to make the same shape over and over, this technique is perfect for you. In this post, an excerpt from the October 2017 issue of Ceramics Monthly, Ben Jordan shares his process for making a cup using plaster press molds. To learn how he press molds his cup handles and adds beautiful slip decoration, see the October 2017 issue of Ceramics Monthly! – Jennifer Poellot Harnetty, editor. 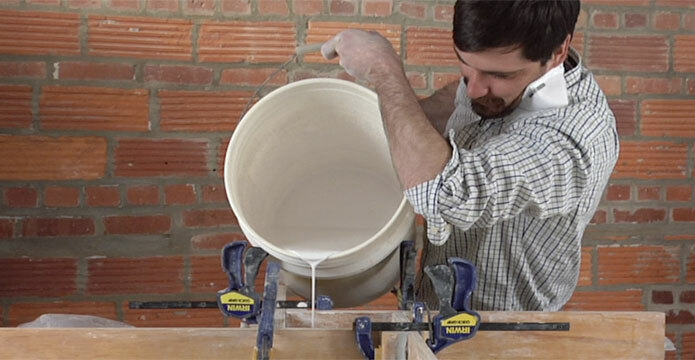 Why Use Plaster Press Molds for Clay? The most satisfying aspect about using plaster press molds is the ability to capture and preserve every detail that I put into a clay form. I start out by rolling a slab of clay about 1⁄8 inch thick. Normally I use a slab roller but two yardsticks used as thickness guides and a rolling pin work just fine. I use a metal rib to compress the clay as well as to smooth it out, removing the majority of the canvas texture, then trace around paper templates made to fit the particular plaster mold being used onto the clay slab (1). Next, I cut out the pieces from the slab and begin pressing them into their corresponding mold pieces (2). 1 Trace around paper templates onto the clay slab to fit the particular plaster mold used for the mug, then cut out the shapes. 3 Use a fabric pouch filled with sand to softly and evenly press the slab into large or concave forms. Though they are quite elaborate in appearance, when broken down, Blair Clemo's pots are really just a lot of simple components put together. In his video, he reveals all the secrets of his unconventional pottery making techniques, which combine handbuilding, press molding, and wheel throwing. In between the oohs and ahhs that tend to happen when watching Blair work, your wheels will be turning as you envision the possibilities with this unorthodox building system. If the mold is large or especially concave, I use a homemade tool that helps to softly and evenly press the slab into the form without causing cracking or creating thin spots in the slab (3). This tool is made using a soft fabric pouch filled with some fine-mesh sand. 4 Cut off the excess clay, being careful to leave some extra at the connection points to ensure a solid and strong seam when the mold pieces are assembled. 5 Score and add slip to the extra clay at the edges of each section, then begin to assemble the mold. 6 Score and add slip to the extra clay at the edges of each section, then begin to assemble the mold. I remove extra clay from pressing the slabs into the mold using a fettling knife, being careful to leave a little extra clay so that when attaching the separate mold pieces together, there is some additional clay at the connection points to ensure a solid and strong seam where the clay comes together (4). Once all of the pieces are cut and pressed into their corresponding mold pieces, I score and slip the edges, then begin to assemble the mold (5, 6), pushing the three side pieces of the mold together then securing them using a bike inner tube cut to the necessary length. Large rubber bands or mold straps also work well for this. I then place the fourth and final piece of the mold onto the other three, pressing the pieces firmly together to ensure a snug fit (7, 8). Using my fingers I press the inside of the mold, pushing all of the seams together as well as ensuring that all of the surfaces are compressed and in place. This creates a number of finger marks inside of the mug. I choose to keep these very much part of the composition as important visual evidence of the making process. The contrast of the less refined interior with the smooth and decorated exterior of the mug is also an intriguing relationship. The porous plaster mold draws moisture out of the clay, allowing the mug to set up and making it easier to remove from the mold. If the mug is left in the mold too long, it becomes overly dry and may also crack. I wait about five minutes before removing the piece, just long enough to let the clay firm up enough to handle (9), and I often use a heat gun to speed up this process. 7 Secure the three sections using a strap, then place the fourth and final piece of the mold onto the other three, pressing the pieces firmly together to ensure a snug fit. 8 Secure the three sections using a strap, then place the fourth and final piece of the mold onto the other three, pressing the pieces firmly together to ensure a snug fit. 9 Further press the inside of the mold, pushing all of the seams together as well as ensuring that all of the surfaces are compressed, then wait for the piece to firm up and remove it from the mold. After the mug is out of the mold, it’s ready to be cleaned up and to have the foot ring attached and thrown on the wheel. I attach the foot by throwing it on the wheel for a few reasons. The first is for practicality: I would have to make a much more complicated mold with more pieces to incorporate the foot. Second, I enjoy the freedom of being able to vary the foot size and shape with each mug by throwing it on the wheel. clay, fettling knife, foot, rib, sand, set, slip, slip casting. Mold making is a very ancient art form. Mold making help you to create stunning and realistic pieces for practical purpose and fun. how are the moulds made I wonder?